Heading away from Lake Doelle-looking down at Doughgod Creek. Photo by Kat Werle. This 3-day backpacking trip offers a tour of three groups of lakes in the Alpine Lakes Wilderness. Chain and Doelle lakes are pristine, and catching a trout for dinner was as easy as throwing a hook in the water. Lake Margaret offers an impressive waterfall comes on the west side of the lake, and the water is not too cold for a swim. This is a fun trip with little traffic — the only people I saw were on the Icicle Creek Trail. 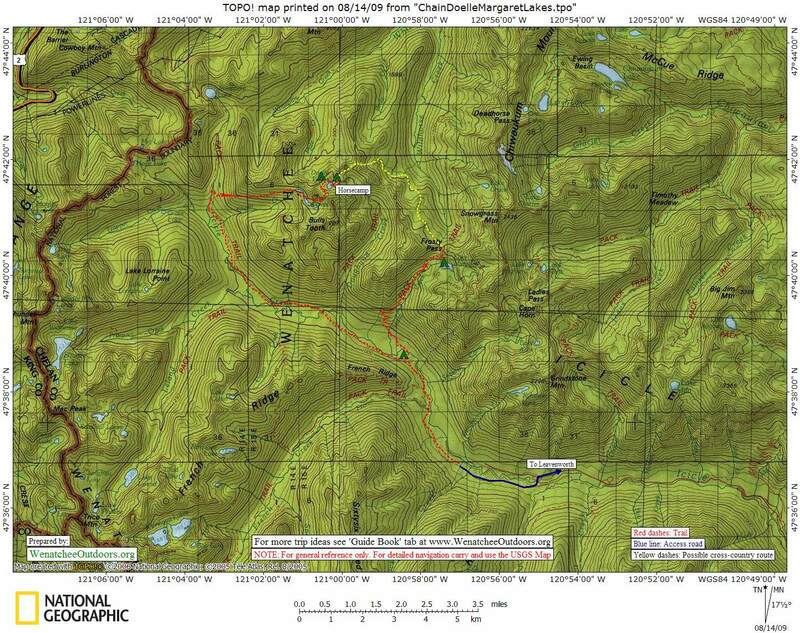 Maps: Print our topo map on 8.5”x11” paper in landscape mode. Note: Use ‘Print Preview’ to properly orient/scale the map before printing. Skill Level: 2+/3- (intermediate to advanced). Fitness: 2+/3- (intermediate to adcanced). Distance: Approximately 22.6 miles total. 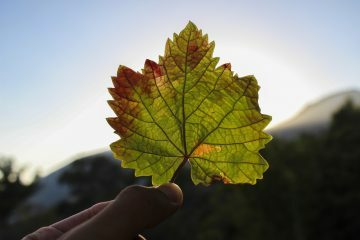 Best Seasons: Mid summer through late fall. Black Pine trailhead with the fire notice. Photo by Kat Werle. Access: Follow US Highway 2 West through the town of Leavenworth and turn left at the west end of town on Icicle Road (there is a large gas station at the corner). If you are coming from the East on Highway 2 over Stevens Pass go right on Icicle Road when you first enter Leavenworth. Follow Icicle Road for about 19.3 miles to Black Pine Campground. Park at the Black Pine Trailhead. JULY 2009 UPDATE. Access the hike by driving up the Icicle River Road about 0.5 miles past the Ida Creek Campground (13.5 miles from the Icicle Junction in Leavenworth) to the landslide that currently blocks the road. Park here (no permits needed) and walk the makeshift road (gated closed and closed to all motorized vehicles) around the landslide. Then follow the road to the trailhead (roughly 5 miles from where you parked). This is particularly easy and efficient to mountain bike. The road is scheduled to be repaired by next summer. –Follow the Icicle Creek Trail #1551 approximately 8.5 miles to the Chain Lakes Trail #1569. –Take a right at the junction and follow the trail climbing up to Chain and Doelle lakes (approx 3.8 miles). I would suggest refueling and hydrating before heading up the Chain Lakes Trail–it is steep with an overnight pack on. There is a beautiful hunk of rock just north of the Chain lakes that I’m guessing folks with stronger legs and backs than mine have hauled up some rope and gear and explored–I half expected to see some bolts on the slabby faces (but didn’t). The ‘rock’ next to Chain Lakes. –Doelle Lake, looking right at Bulls Tooth, was a perfect place to camp for the first night. There is also a horse camp sign just west of the smaller Doelle Lake. 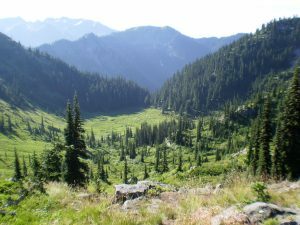 –On the second day, I started the trail that follows the ridgeline above Doughgod Creek, the trail either fades away or I couldn’t find it. In my haste to get out of the house I forgot my compass forcing me to find the obvious way to Frosty Pass. There is some cross-country travel involved between Doelle Lakes and Frosty Pass. There are a variety of ways to make the trip, but we have shown (on our map) one possible high route that allows for easier travel. 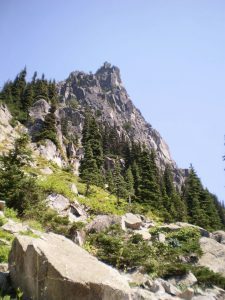 –Knowing the trail to Lake Margaret was on the other side of the ridge, I hiked up and over, spying the trail far below. The trail is Frosty pass #1592 and leads to Lake Margaret. There are campsites at the lake, but I decided to camp down by Icicle Creek instead. –Follow trail #1592 back down to Icicle Creek Trail #1551 (approx 4.1 miles). There is camping near the junction. 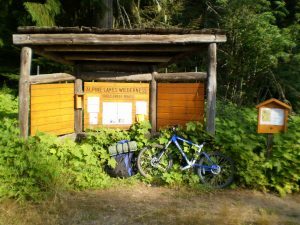 –Take the Icicle Creek trail to the Black Pine trailhead. There are lots of berries to keep you going on the lower trails. Other Issues. There is a notice at the trailhead that there is a fire burning on French Ridge Trail that is being monitored, I didn’t really notice any smoke and saw a water- toting helicopter fly overhead. Swarms of flies and mosquitoes can also be a nuisance in this area at certain times of the year. At the date of this trip report (August, 2009) there were some mosquitoes and flies, but not enough to ruin the surroundings. Allowed. 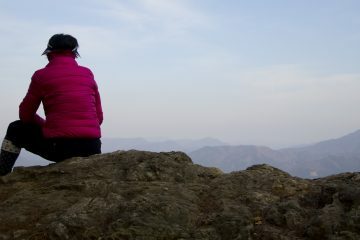 Hiking, horseback riding is also permitted in certain areas. Motorized vehicles and mountain biking on the trail are not permitted. Land Ownership. National Forest, Alpine Lakes Wilderness. Fees/Permits. 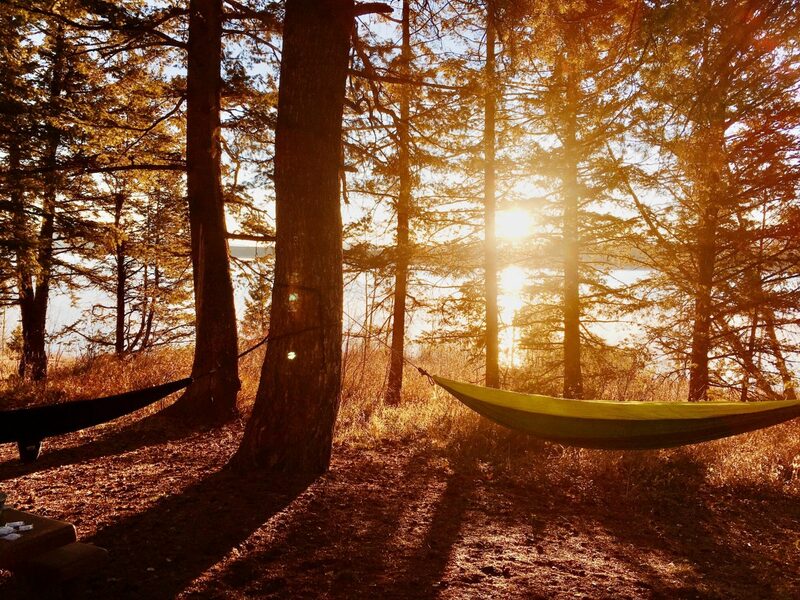 A Northwest Forest Pass is required for parking at the trailhead and passes are needed for overnight camping. Hikers can self-register for passes for camping at Lake Margaret and Lake Mary at the trailhead. If you have any questions, call the Leavenworth Forest Service at (509) 548-6977. Other Trips. 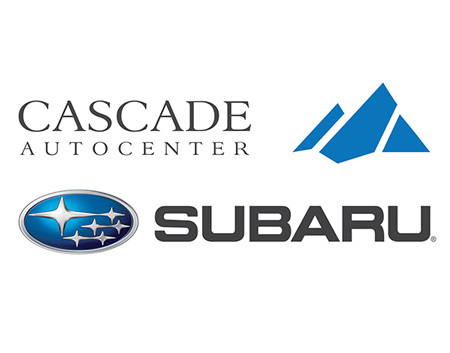 Depending on your interest, click on the appropriate guidebook at our index of guidebooks. 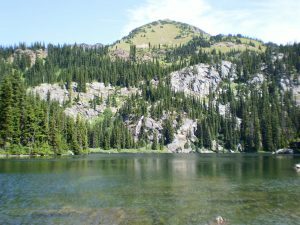 See this link for more information about hiking from the Black Pine trailhead to Lake Margaret and Snowgrass Mountain. This post was originally published on 8/14/09. Backcountry Skiing – Where to Go?